Tales of a Time Traveler transports the reader to a different era, when life was simpler and largely tax-free. The author's trusty, but somewhat rusty Tauru model time machine visits forgotten mining towns, lost railway stations and century-old trails. He explores the ghosts of the past, unlocks the secrets of the forbidden city of Kitsault and finds traditional ways in native settlements and fish camps. While visiting misty mountains and remote lakes in the clouds, the author finds old cabins and meets descendants of the early pioneers who built an amazing life in these rugged places. The masters and their disciples still take care in maintaining beloved cabins hidden in an inaccessible wilderness. 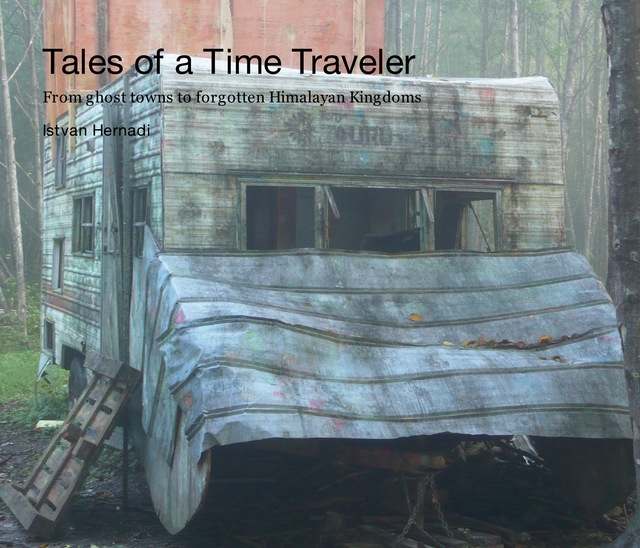 With a swift jump through space the Time Machine continues its journey to the ancient civilizations of the Kingdom of Sikkim, the Queen of the Himalayas and the Land of the Thunder Dragon ruled by the Druk Gyalpo. The author follows in the footsteps of the early Hungarian Tibetologist Sandor Korosi-Csoma on his way to uncover the secrets of Hungarian ancestry in central Asia. Here the Masters of the Buddhist way of life continue their quest for enlightenment amongst the fluttering prayer flags and whirling prayer wheels in hidden monasteries and dzongs of the lofty peaks. From the blue poppies of Darjeeling to the icy summits of the five-peaked snow fortress of Kanchenjunga, this is a thrilling adventure for time travelers everywhere.